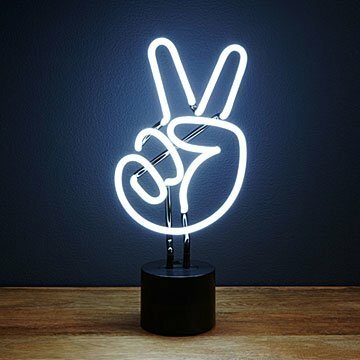 Give peace a chance with this playful neon desk lamp. Ideal for anyone who says "yes, please" to world peace, this neon lamp emits a cool white light and fits perfectly atop small surfaces, like bookshelves, nightstands, and console tables. Fun, functional, and primed for a spot on your desktop, the design makes a statement without distracting from your carefully considered decor. Low voltage DC adapter included. Made in China. Do not leave on for extended periods of time. A great and well known symbol and reminder for young folks along with a practical eye catcher light. Fun light for teenagers room.